This picture doesn’t really accurately get across just how nasty that color really is. It’s like a greyish-purpleish-brownish gone wrong. The camera didn’t even understand it. Eventually, something had to be done about this mess. Seriously, why couldn’t we just have had one of those beautiful, charming Victorian scroll-y ones? Photo from the lovely DoorSixteen. 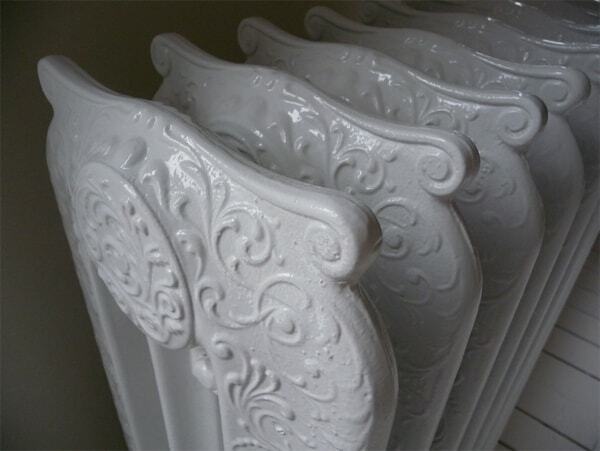 Christmas was the perfect occasion, I thought, to make the radiator a little less vile. 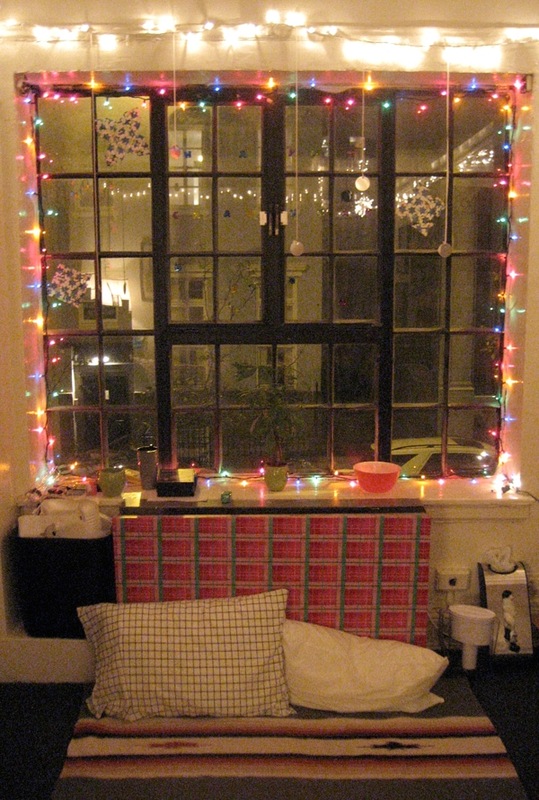 But you can only really keep Christmas wrapping paper on a radiator for so many weeks. Plus, especially when half the colored lights went out, the ornaments came down, and the snowflakes melted, this didn’t really address the problem of the naked windows. Though you’ll notice those blinds are gone. I’m a nevernude. 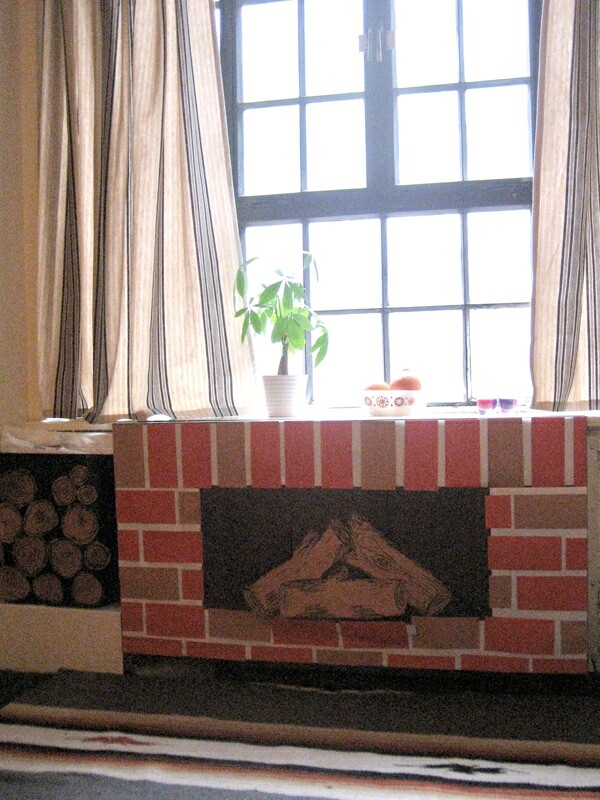 So one night Eva and I got real, real crafty and made this fireplace out of construction paper and double-stick tape. I freehanded the logs myself (no formal training!). Unfortunately, it just wasn’t build to last, so realistically it was only up a few weeks. It was lovably tacky (puns!) while it lasted, but God had other plans. I’m a big believer in picking at paint endlessly if it’s chipping, even if it involves extended vacuuming sessions afterwards. Which is why I ended up repainting my closet door after the first couple weeks after move-in. I just couldn’t stop picking that damn paint. TRY to tell me that’s not satisfying, I dare you. So I had a can of white paint. 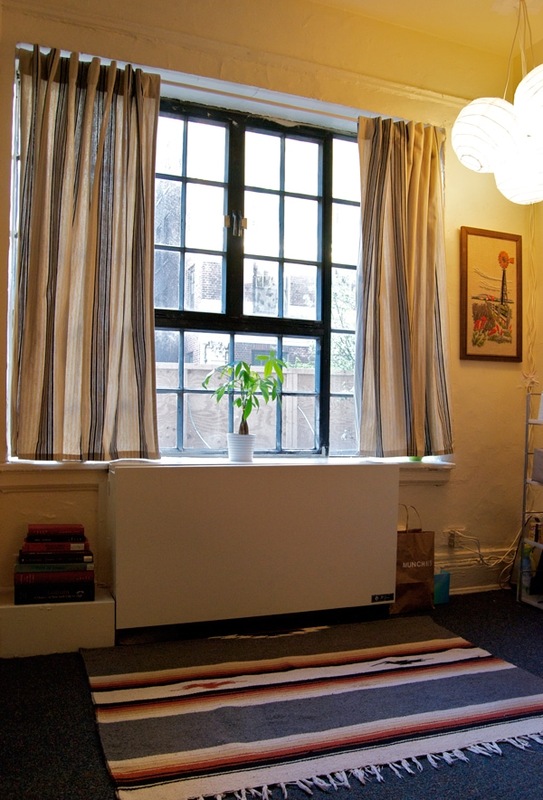 And a really ugly radiator. And here it all sits today. I’m SO glad I painted it– I did a good job, so I’m not anticipating any weird charges from the maintenance staff. The lanterns, curtains, and rod were all bought on the cheap from IKEA. The rod is actually a shower curtain tension rod, which works beautifully for this since I don’t currently own a drill (first big purchase once I move, don’t worry). So while I wish the rod was black and I hadn’t iron-on-hemmed the curtains too short, this is as good as I could justify making this all look while staying within a tight budget and recognizing my time here is very limited. 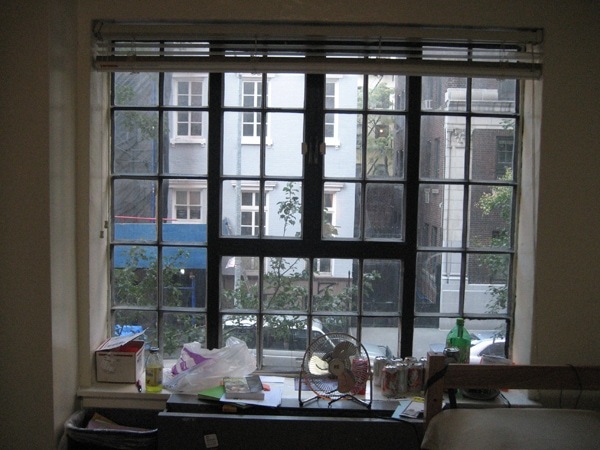 I’m also hoping I can reuse the curtains (or just the fabric) and the lights somehow in the new place. See, I think about the future and stuff. But it’s worlds better, right? Scroll back to the top if you don’t see it. i really love the fireplace one, it looks amazing. very creative. Great job making the most of it! You have a gift. Thrilled to see it in action. Wow! 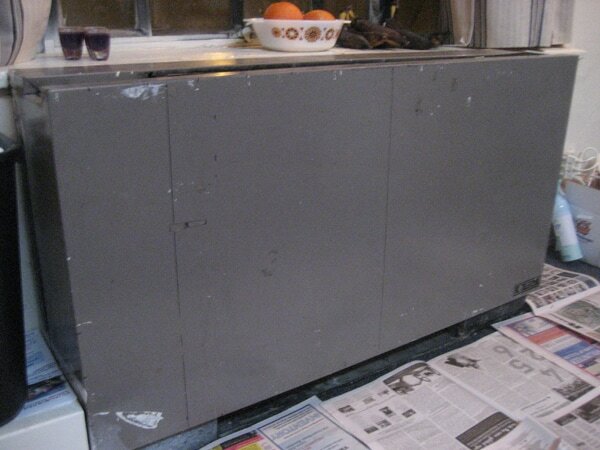 You really did do a great job painting that radiator!